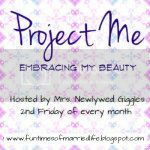 Life with Giggles: Project Me: Embracing My Beauty Link-Up!!!! You can read about this Project Me that I started here. I was thinking of making it a link-up, but was afraid! Then Nikki convinced me to NOT be afraid and go ahead with it. So, here's to my first link-up to empower all of us to show of how beautiful we are!!!! So, grab the button, tell your friends, and join the link-up!!!!! LET'S SPREAD THE LOVE OF BEAUTY!!!! !